A large horizontal dial of brick and stone with a formed structural steel gnomon in the form of a modern sculpture. Roman numeral hour marks doe DST are on raised brick pillars. A large Erickson Monument equatorial polar dial 6 feet in diameter made of light granite with a 3 inch steel rod as gnomon. The dial was dedicated as part of the bicentennial celebrations in July 1976. Hour lines from 4am to 8pm. Time is graduated by half-hour, quarter hours and 5 minute marks. Designed to be read from the upper surface in Spring/Summer, from the under side in Fall/Winter. A plaque provides the Equation of Time to convert solar time to watch time. Dial has both the bicentennial emblem and the city seal of the city of Aurora. A horizontal dial using a 60 cm brass plate gnomon with a slit that projects a shaft of light onto the dial face inscribed with un-numbered hour lines. Dial sits atop a cubical marble base with a plaque bearing the inscription. A large polar equatorial dial by Erickson Monuments, known as the "Tippit Sundial" given by John Tippit in memory of his son. The dial is of dark red granite, 6 feet in diameter and 6.375 inches thick. The gnomon shaft is steel, extending from the ground through the dial plate and outward another two feet. 24 hours are inscribed on each side of the dial (summer and winter) as radiating lines with Arabic numbers at the end. Time is graduated by half-hour and 5 minute marks. Designed to be read from the upper surface in Spring/Summer, from the under side in Fall/Winter. The hours on the under side of the dial were originally engraved backwards. Two plaques provide the Equation of Time to convert solar time to watch time. The dial rests on a cement work 7 feet high. This equatorial dial is one of the more distinctive Erikson Monument dials. It is octagonal about 4 feet across, made of white granite. It has a supporting stainless steel rod as gnomon. Hours from 4am to 8pm with 15 minute divisions. The hours are not rotated for longitude, placing the 12pm hour directly at nadir. Below the sundial is a plaque containing a graph of the equation of time. A 4 inch thick rose granite equatorial dial with a triangular dial face 60 inches on a side. A 70 inch long gnomon rod holds a 6 inch diameter spherical bronze nodus showing Earth as seen from space placed so that the Earth's axis is on the gnomon axis. The dial face shows solar noon and the dateline shows the date at solar noon and the equation of time. The granite plates are set 4 inches into concrete. A monumental 120 foot diameter horizontal dial of painted concrete with a vertical 12 foot high concrete gnomon. Standard time and DST hour numerals are shown as are solstice and equinox lines. Dial face includes two 6 foot diameter inlaid mosaic maps of the Western and Eastern Hemispheres. The gnomon is a truncated three-sided equilateral pyramid that inclines to the north so that the northern corner is vertical. Two bronze plaques give instructions for reading and equation of time correction. Seen from above, the overall design incorporates a Yin Yang symbol appropriate for this elementary school specializing in teaching Chinese language and culture. A point-in-space or nodus dial with a 65 foot diameter dial face with seasonal markers extending nearly 150 foot wide due to uneven terrain. Time and date are indicated by the shadow of the tip of the 15 foot high curved gnomon. The dial is made of concrete, steel angle, cast iron and Breeze Stone, a compacted crushed stone. Roman hour numerals are cast iron, cast by students at The Colorado Springs School. The dial was designed and built by students, alumni and faculty of the school over a five year period. Provision is made for 60 stone date markers, set to indicate dates of significance to the school calendar. Analemmatic dial in granite and bronze. 9ft x 12ft. Mottled granite block surface with number border of smooth granite blocks. Hour numbers are engraved in granite. Zodiac marker is brass, embedded in the granite face. As with most analemmatics, the dial is not corrected for longitude. Fortunately, the location is very close to the center of the time zone at 105 deg W. User stands on a central analemma at correct date and acts as the gnomon to cast a shadow that points to local solar time. The aspect ratio is not correct for the latitude and the positions of the solstice markers are slightly off. A vertical dial approximately one meter square, built into the wall of the 1907 Van Briggle Pottery building. This Memorial Pottery building was erected after Artus Van Briggle's death. The Van Briggle Pottery Company is now using the Midland Railway roundhouse at Hwy 24 and 21st. In addition to hour lines with Roman numerals, surrounding tiles have pictures of the zodiac. 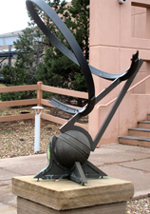 In 1994 Colorado College repaired the gnomon and added a metal equation of time plate. An old horizontal dial approx 60 cm diameter. From 1914-1967 was located at Marksheffel Garage, relocated to Monument Valley Park in 1967. The builder may have been van Briggle Pottery, but its history is more complex: The angles of the hour lines are consistent with a latitude of 43.9° (roughly) but the present location is 38.9°. A gnomon (probably not original) was cut for 34° lat, but has now been corrected. Likewise, the whole dial had to be rotated to true north, being off by some 47°. Hour lines have eroded, and those before 6am and after 6pm radiate from the wrong side of the gnomon. The city has spent a considerable amount of money cleaning up the area, removing the shrubs that blocked sunlight and building a nice brick wall with flowerbeds, so the area looks better, but the dial is worse than ever, with vandals bending the gnomon. Large Erickson equatorial monument dial. It consists of a disc of pink granite about 6 feet in diameter and 6 inches thick, tilted on edge to align with the earth's equator. The gnomon is an approximately 3 inches in diameter, made of a stainless steel rod piercing the disc at 90 degrees. It supports the disc from below, and protrudes about 2-3 feet above the disc; far enough that it casts a shadow on the face of the disc all summer. Winter shadows fall on the back side of the dial, also engraved with hour lines. The original sundial was erected in 1941. Dean Babcock was associated with the late Stephen A. Ionides of Erickson Monument Co. in designing and setting various sundials in Colorado, including this one. When George Cranmer undertook to place a dial of Chinese tradition in Cranmer park, Dean helped Ionides to translate the Chinese characters into Arabic. The stone cutter was probably John Earl Hershberger. The dial was replaced with the current one March 21, 1966 after the original was dynamited by vandals. The sandstone of the sundial base came from Lyons, Colorado. It is 5'5" thick and extends two feet below the pavement. In his inimitable style, Cranmer wrote in 1950 that "the sundial is only seventeen seconds of time East of the 105th Meridian on which Mountain Time is based, and since the whole setting is so accurate, one can set his watch by it." Erickson Monument, makers of the original sundial, created the award replica. A large horizontal 6 1/2 ft. x 4 ft. dial in bronze A child figure stands, casting a shadow on the sundial. Child's hands should hold a gnomon rod, now missing. Dial and figure are placed atop a granite pedestal. On the southwest side of the Emerson School Building (now an office building and historic landmark) is a large white stone vertical dial with a stone gnomon. The large stone dial is part of the original brick building erected in 1884. Local history holds that the original architect was somewhat staid and stuffy and only agreed to include the sundial "because of its educational value." The dial was restored when the building was refurbished. See "Sightings" in NASS Compendium Vol. 6 No. 4, Dec 1999. An internal cylindrical dial on the walls of the entrance tower to the Science Building of Kent Denver School. A glass-covered 1/8 inch aperture in the center of ceiling dome projects a spot light onto the inner vertical cylindrical wall of the vestibule. Aluminum strips mark the solar altitude and azimuth. Bronze strips mark the equinox and summer solstice. Bronze and nickel domed nails form the hour analemmas showing Mountain Standard Time with daylight savings time below. The dial design is by science teacher David Potter and architect Paul Hutton proportioned the "Sun Tower" so the summer solstice noon mark would be at the bottom of the cylindrical wall. Artwork on the ceiling includes a hand-painted winking "Sol" in a 24 point compass rose. This dial in on private property but access may be arranged by calling the school on weekdays between 8:00 AM and 3:00 PM. The Archie Lynn Chase Sundial is an equatorial polar dial. Unlike other monumental polar dials (designed by Erickson Monument Co), the dial face is more of a rounded square than a circular disk. Hours, half hours, quarter hours and five minute lines mark the time from 4am to 8pm. The hour lines are rotated for the site latitude. A steel gnomon rod about 3 inches in diameter casts the shadow. Has a plaque describing the Equation of Time. An 11x15 foot poured concrete human analemmatic dial with Standard and DST numerals, seasonal markers and an EOT plaque. The dial is located on the playground of an elementary school. The Littleton War sundial is an Erickson equatorial polar dial 6 feet in diameter made of light granite with a 3 inch steel rod as gnomon. Time is graduated by hour, half-hour, quarter hours and 5 minute marks over 24 hours. Noon is at the bottom, matching the 105 degree meridian. Designed to be read from the upper surface in Spring/Summer, from the under side in Fall/Winter. A plaque provides the Equation of Time to convert solar time to watch time. Dial is in a beautiful setting. Stonehenge type dial designed by Judy Guttormsen and built in 1984 . Stonehenge itself an amphitheater. If you stand on a brass marker in the center of the stage, on the solstices and equinoxes, you can observe the rising and setting of the sun aligned with metal posts viewed through slits in the wall. At the south edge of the site is a 6 foot horizontal dial laid out in the concrete floor. There are two rings of numbers, one for standard time, one for daylight time. Not corrected for longitude, but the location is very close to the center of the time zone. The gnomon is cement and is unusually thick (approximately 40 cm), making it very sturdy, presumably to prevent vandalism. The surface of the gnomon is very rough, having embedded pebbles, making it an uncomfortable place to sit or climb. The metal inscription plate on the gnomon has faded too badly to read. The site also has a North Star finder made of wrought iron and has a small bench for children to use. 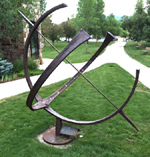 This equatorial sundial is a memorial to Barbara Perry Cosel and sits in front of the"Bud" Werner library. A large 6 ft. thin iron equatorial, it is constructed of two 270 degree arcs that intersect at right angles. Time marks are simple detente marks on the equatorial arc. The gnomon is a traditional arrow. At the base of the dial is a plaque containing a graph of the Equation of Time to determine Mountain Standard Time.